Even if you've never heard of this massive computer, the Gazelle is truly a historic computer. Neither because it was one of the first 8088, then 8086 based computer, nor because this Gazelle is propably the heaviest 8088 system ever built, but because it was the computer Tim Paterson wrote DOS for, the first DOS operating system that became later MS-DOS 1.0 when Microsoft bought the rights to DOS from Tim's company, afterwards. See in the "Internet Links" section various links about Tim Paterson and origins of MS-DOS. The Gazelle was a S-100 bus based system, engineered to be fast, reliable and expandable. Eighteen S-100 boards could be installed in the case, as well as an additional 8" Winchester hard disk. The Constant-voltage power supply provided clean and constant power, even under brownout conditions. It also allowed reliable operation in a noisiest electrical environment. 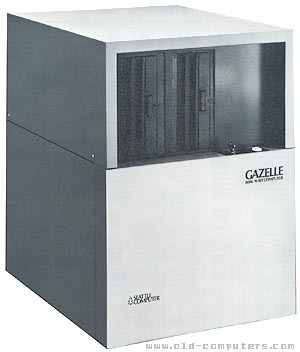 The Gazelle was discontinued in 1983, and Seattle Computer continued to manufacture more standard PC compatible systems. see more Seattle Computer Gazelle Ebay auctions !